The video player is driven by a F4M manifest file located in the folder, /webroot/dynamicStream.f4m . If your video does not show, you may need to edit the F4M file and change the server name. Simplify the development of robust media players by leveraging OSMF. Users can leverage features within Flash Media Server or external services like advertising and analytics easily with faster turnarounds. Sample players are also available. Tools to prepare your videos for HTTP Dynamic Streaming and deployment. Monitor FMS using this command-line tool. Integrate this tool into your monitoring software and maintain higher availability. Deploy this application to enable DVR functionality for RTMP streaming. Use this application to make it easy to set up and deliver multicast broadcasts. 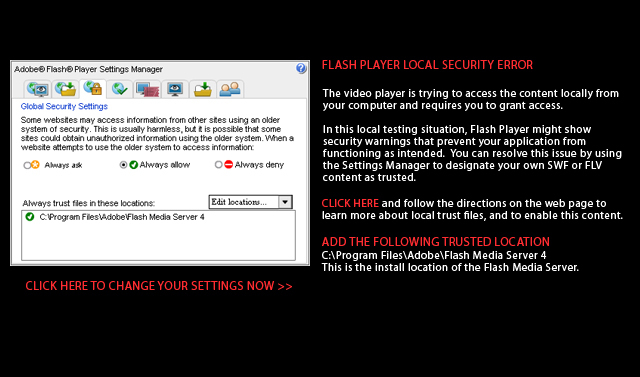 Everything you need to know about Flash Media Server 4. Everything you need to know about streaming live and recorded video over HTTP. Enhance your video project with the interactive features of Flash Media Interactive Server. Download and install this AIR application to see how FMS can help engage your audience longer. Adobe® Flash® Media Interactive Server lets you increase your streaming capacity with flexible delivery methods including IP Multicast, Unicast and HTTP Dynamic Streaming while adding rich real-time interactive experiences. Scalable server deployment made easy - launch instances of Flash Media Server on Amazon EC2 with a pre-configured Amazon Machine Image (AMI). Adobe® Flash® Media Streaming Server enables you to start streaming quickly and easily by protecting your high quality media within your business. Adobe® Flash® Media Live Encoder lets you capture and stream your live video content with high quality H264 or VP6 encoding for both Mac and PC. Flash Media Enterprise Server Adobe® Flash® Media Enterprise Server helps to reduce your bandwidth and deployment costs while enabling real time multi-user applications using RTMFP functionality, enterprise-level Multicast Fusion and delivering video online using Peer Assisted Networking. Protect your valuable content and create new business models for your media.